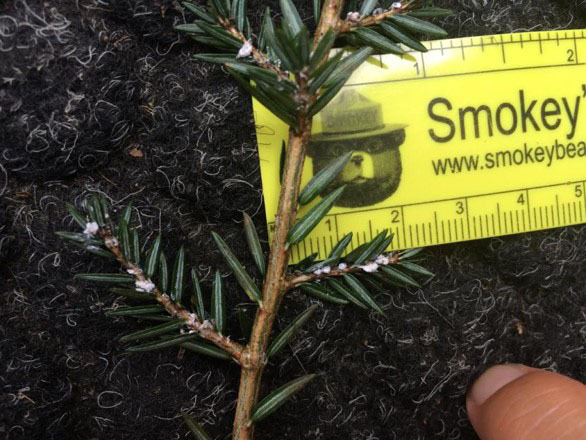 Eastern hemlock trees are dying across much of eastern North America from the invasive hemlock woolly adelgid (HWA). Due to the persistent changes in terrestrial and stream ecosystem structure and function, a wide variety of strategies are being developed and implemented to reduce the effects of HWA on eastern hemlock. Surveys have shown that eastern hemlock populations with high foliar nutrient concentrations are associated with low HWA infestation rates and also suggest that deeply shaded trees may be more susceptible to HWA infestation. In this experiment, researchers infested eastern hemlock seedlings with HWA across a range of shade conditions and tracked foliar nutrient concentrations and infestation levels. The scientists detected inverse relationships between ambient light and leaf nitrogen concentration and HWA density. The results suggest that infestation may be more severe in heavily shaded environments, and that nutrients might be mobilized to the leaves after infestation to create even greater susceptibility in these shaded environments. This study illuminates possible mechanisms of hemlock susceptibility to infestation in the field. Silvicultural treatments that increase light incident on the hemlock canopy may reduce susceptibility to HWA infestation.